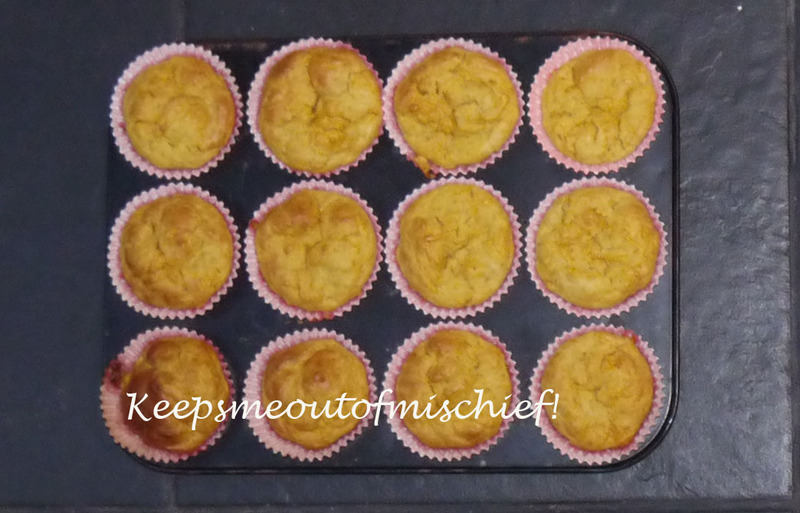 Carrot and Pesto Muffins | Keeps Me Out Of Mischief! These should also be known as ‘tidying out the fridge muffins’. Too many eggs and carrots in our fridge and a need to use them rather than waste them but not feeling the vibe of just carrot muffins so a lonely bit of pesto livened them up a bit! You will need: 1 medium egg, 200ml milk, 60ml olive oil, 250g self raising flour, 25g green pesto, 170g grated carrots and a twist of salt. Preheat the oven to 190°C and line a 12 hole tray with cupcake cases. Whisk together the egg, milk and olive oil. Add the flour, pesto, grated carrot and salt and mix until just combined. Spoon the mixture into the cases – you can afford to fill the cases about 2/3 high – I didn’t for fear of them spilling over but they didn’t rise as much as anticipated and I made 16 smaller muffins instead. Bake for 25 minutes. Delicious with tomato soup or warm and spread with a little cream cheese.